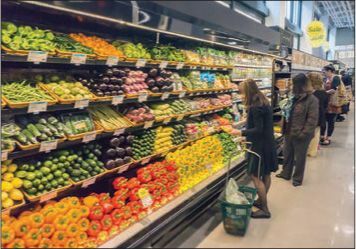 Grocery shopping may never be the same, said Davey Alba in Wired.com. Amazon took a giant leap forward in its quest to become the “Everything Store” last week with its $13.7 billion, all-cash acquisition of Whole Foods. The deal, Amazon’s biggest ever, isn’t necessarily a surprise. Amazon “has been trying to crack the food delivery business for a decade.” But while the online retailer has arguably perfected the art of putting dry goods on customers’ doorsteps, it has struggled to do the same with fresh food. That could change quickly now that Amazon has access to Whole Foods’ sprawling supply chain, as well as its 431 stores—most of them in wealthy areas—which could soon double as pickup points for online orders. In the near term, this deal is pretty straightforward, said Derek Thompson in TheAtlantic.com. “Amazon needs food and urban real estate, and Whole Foods needs help.” The upscale supermarket’s revenue growth has tumbled every year since 2012, and investors have been pushing loudly for a sale to a larger grocer as the stock has nosedived. Amazon is “the perfect net.” But in the longer term, this deal “is about Amazon as a ‘life bundle,’ particularly for affluent Americans.” Amazon Prime has already become like the cable bundle of old—“merchandizing convenience” with streaming entertainment and fast, free delivery. More than half of U.S. households with income over $100,000 a year are already Prime subscribers. With Whole Foods in the mix, Amazon’s dominance of the coveted “yuppie market” should only grow. “Amazon’s takeover of Whole Foods sent the stock of competing grocery chains plummeting,” said Matthew Yglesias in Vox.com. But then, it’s hard to compete with a rival that doesn’t seem to care about making money. It’s not unusual for Amazon to report nearly zero in net income in quarter after quarter as the company plows money into developing new businesses, whether it’s producing original TV shows or building artificially intelligent speakers. Whole Foods under Amazon will almost certainly accept lower profit margins than it does now, “and that spells trouble” for nearly every other grocer in an industry already infamous for its razor-thin margins.